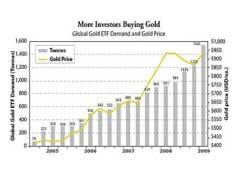 Gold Closing Price – What To Pay Attention To? Spot price of gold is determined daily by the Commodity Exchange (COMEX) agency located in New York based on gold futures prices, or simply contracts to deliver and to receive certain commodity obligations. If you keep a watchful eye on a number of bullion trading websites, you will see that gold bullion prices are not fixed but are rather fluctuating day to day to reflect the gold spot price. Gold closing price is estimated based on the average price of gold futures that are being traded within the last two minutes of a business day. COMEX’s trading of gold futures normally stops at 1:30 pm EST during a business week. Gold closing price is quoted in US dollars and could be obtained at goldprice.com website with up to the minute live updates. You can sign up for customized daily or historical gold charts to be sent directly to your phone in the currency of your choice to make gold investing easier for you. You can pick from 29 world currencies in grams and kilos indicators. Majority of people participating in the COMEX futures trading are big time gold dealers and giant gold manufacturers or anybody who can afford buying 100 troy ounces bars per gold futures contract. Many individual investors find it more convenient to buy gold bullion bars of smaller sizes for ease of storage and liquidity from gold dealers. Gold closing price is a very important indicator of not only the current price of gold on a given day but of the strength of a certain currency this price is quoted in. For example, if you compare gold closing price in two different currencies, USD and GBP, you will see that USD gold closing price by far exceeds its GBP values percentage wise. This does not, however, mean that the actual value of the gold has increased but merely that USD currency is weaker compared to GBP. As a side note it’s important to mention that India is one of the largest consumers of gold in the world; therefore gold price in India today is a major factor for gold price prediction across the globe.